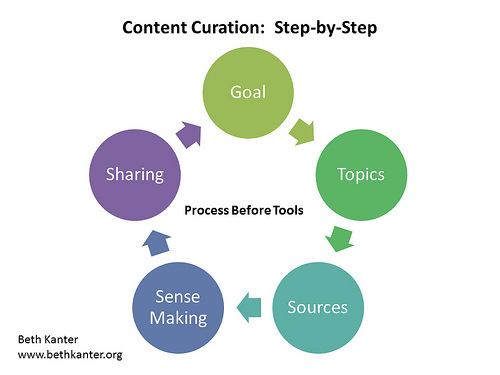 If content is currency, what does that make content curation? We’ve all heard the buzzword thrown around, but let’s take a quick look at what it is and why we need to practice it. And while algorithms have gotten better at detecting spam, they aren’t keeping up with the massive tide of real-time data. Content curation is the process of sorting through the vast amounts of content on the web and presenting it in a meaningful and organized way around a specific theme. The work involves sifting, sorting, arranging, and publishing information. A content curator cherry picks the best content that is important and relevant to share with their community. 1. Be Part of the Content Ecosystem […] not just a re-packager of it. […] Created, contributed, and collected — the three ‘c’s is a strong content mix that has a measurable impact. 2. Follow a Schedule. Make sure to post at the same time each week. 3. Embrace Multiple Platforms. Today content consumers get their information on the platform of their choosing. That means you should consider posting short bursts on Tumblr, images on Pinterest, video on YouTube, and community conversations on Facebook. 4. Engage and Participate. Make sure you’re giving back by reading others and commenting on their posts. 5. Share. Don’t Steal. Take the time to give attribution, links back, and credit. Speaking of stealing, Rosenbaum stresses that content curation is, of course, more involved than pushing a share button; and sharing online content also has its set of solid parameters that distinguishes it from stealing. Proper attribution, for instance, is crucial, including obtaining permission for the images or only using the copyright-permissible ones. 1. If you don’t add context, or opinion, or voice and simply lift content, it’s stealing. 2. If you don’t provide attribution, and a link back to the source, it’s stealing. 3. If you take a large portion of the original content, it’s stealing. 4. If someone asks you not to curate their material, and you don’t respect that request, it’s stealing. 5. Respect published rights. If images don’t allow creative commons use, reach out to the image creator — don’t just grab it and ask questions later. 5. Chronology, which could be defined as historiographical content curation. Usually it consists in presenting a timeline of curated information to show the evolution of a particular topic. Curata recently found […] that websites that are curated on a daily basis receive 18 percent more click-thru activity than those curated on a weekly basis. Curators understand the value of timely content, and today almost half (45 percent) of them indicated that they share content on a daily basis. This represents an 18 percent increase over the 2011 Content Curation Adoption Survey. Establishing or improving thought leadership continues to be a primary objective of content curation: 8 percent more marketers cited it as their primary objective than a year ago. Social media is a preferred channel for both finding and sharing online content: 79 percent of marketers cited social media as their favored method for finding third-party content, and 76 percent responded that social media was their top choice for sharing content. Resources are being dedicated to content curation: 50 percent of marketers indicated that there were one or more people at their organization dedicated to curating shared content. Three quarters of marketers who identify themselves as content curators dedicate up to 25 percent of their marketing budgets to content curation. It would be interesting to see how the “rules” and best practices of content curation evolve in a year or two, and what tools will come out on top. Image of Flash is by mondi (Ramos Alejandro), used under its Creative Commons license. Content curation graph by Cambodia4kids.org (Beth Kanter), used under its Creative Commons license.